The wooden vessel sank in the Weddell Sea off Antarctica more than a century ago. More than a century has passed since the Endurance, the three-masted ship of legendary explorer Sir Ernest Shackleton, sank in the Weddell Sea off Antarctica, and now researchers are getting ready for a major scientific expedition to find it. The Weddell Sea Expedition 2019 will bring together an international team of scientists to look for the shipwreck, which is believed to lie about 3,200 meters (10,500 feet) under the waves in one of the planet's coldest and most forbidding environments. 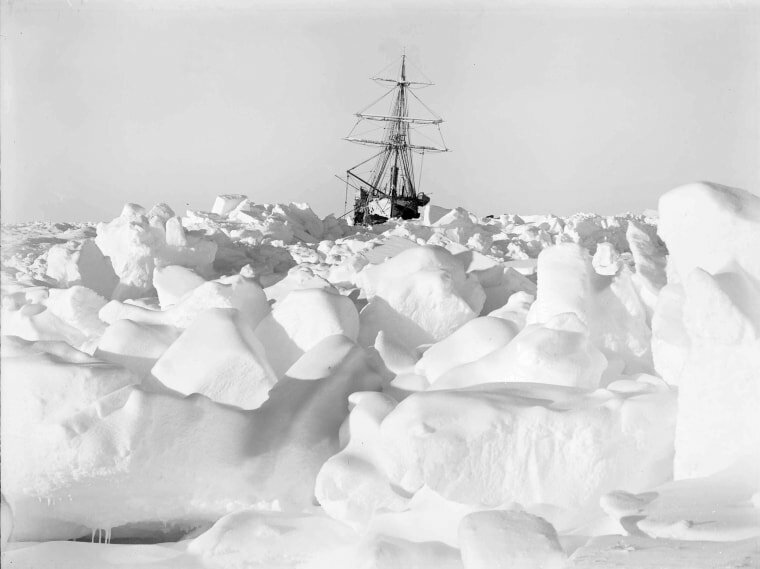 Led by researchers from the University of Cambridge, the team will use autonomous underwater vehicles in their effort to locate Shackleton's sturdy wooden vessel, which sank in 1915 after being crushed by sea ice. The effort is part of a larger, 45-day mission to study the ecosystem of the Larsen C Ice Shelf, which itself was in the news last July when it calved an enormous iceberg the size of Delaware. "Because the wreck site of the Endurance, under sea ice in the Weddell Sea, is such a difficult place to access, no survey has ever been done before," Julian Dowdeswell, director of the university's Scott Polar Research Institute and the leader of the planned expedition, told NBC News MACH in an email. "The advantage of deploying cameras and sonar equipment on an autonomous underwater vehicle (AUV) is that we do not have to be directly over the wreck site. If the AUV is launched even 100 kilometers from the site, it can get there beneath the sea ice canopy and undertake survey work." Dowdeswell said at least two AUVs will be used, each able to reach depths of 6,000 meters. The free-swimming submersibles will be equipped with cameras and sensors for temperature and salinity along with sonar capable of looking upward at the bottom of the ice shelf as well as downward at the seafloor. The AUVs will be launched from the expedition's research vessel, the S.A. Agulhas II, a South African icebreaker that is equipped with a variety of labs and is considered one of the world's most modern research ships. There are no guarantees that the expedition, which includes researchers from South Africa and New Zealand, will be successful — or even that the researchers will reach the site where the Endurance went down. "Whatever ship you have, it's possible it won't get there," Dowdeswell said in a written statement. "It could be a better or worse sea ice year, so everybody is going into this with their eyes open." This isn't the first time such an effort has been contemplated. "There have been many attempts to organize expeditions to locate the Endurance, but they all seemed to fizzle or fall apart because of a lack of money," said Dr. David Gallo, former director of special projects at the Woods Hole Oceanographic Institution and a noted expert on undersea expeditions. But, he added, "They have some very talented people aboard, and I think they have a good chance of launching it." The real question, Gallo continued, is whether the team is prepared for "what's coming next" — a reference to the difficulties associated with the remoteness of the location and the difficulties of launching submersibles through ice that Gallo said could be as much as nine feet thick. If the researchers do reach the site and locate the ship, they may find that the Endurance held up well despite all those years underwater. The last photos taken of the ship show that while its masts had come down by the time of its sinking, its hull was largely intact. And since there is little or no wood in the desolate area, organisms there are adapted to break down whale bones instead. "Thus it is thought that the wreck will be largely unaffected by burrowing marine organisms," Dowdeswell said. Shackleton set sail aboard the Endurance from South Georgia Island in December of 1914 in a quest to be the first to cross the Antarctic continent. But the ship got trapped in ice the following month and ultimately was destroyed by it. Shackelton and his entire crew managed to survive what was known formally as the Imperial Trans-Antarctic Expedition, but only after mounting an arduous journey that has become known as one of the world's greatest stories of survival. If the wreck is found, no artifacts will be brought to the surface. Instead, plans call for the the team to photograph and map the wreck with the goal of making it a protected historic site.